If you’re joining in today’s #ltbloggers Twitter chat then you will see most of this post but even so I’m going to give you a quick Q&A about Bonfire Night! Q1 – It’s Bonfire Night! Are you a fan of bonfires & fireworks? I do like fireworks – they’re amazing to watch! The only trouble is that the dogs go potty with the noise of fireworks! It’s going to be a long evening that’s for sure! And the fun doesn’t stop this evening as there’ll be more fireworks over the weekend! 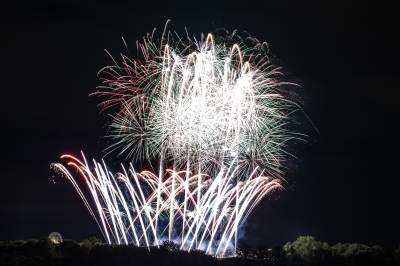 Q2 – What’s your first memory of Bonfire night? The neighbours always threw a great bonfire and their Nain would do jacket potatoes in silver foil for everyone to roast on the fire. The other memory I have is of the neighbours pretending to throw my Dad in the fire. I got so upset by it! Q3 – Did you ever do “penny for the guy?” thing? No I don’t think I ever did that. If you don’t know what I mean then on Bonfire night (also known a Guy Fawkes night) kids would make a Guy effigy and stand around asking people for money “Penny for the guy Sir?”. Q4 – Best firework display you’ve seen? Disneyland Paris! I was lucky enough to get the last spot on a coach trip organised by my Nain K and went to Disneyland for Bonfire Night weekend. We stayed at one of the resort hotels (I forget which one) and got to see the fireworks over the lake and castle. Was pretty magical I must admit. Q5 – Any plans for this evening? None whatsoever – girls too young to be stood out in the cold! I can’t wait to take them to see the fireworks. I would love to know what their reaction would be. Maybe next year! Whilst this isn’t a tag, I tag you all to answer my questions!